+ Fixed error that buttons in Album Detail were duplicated. 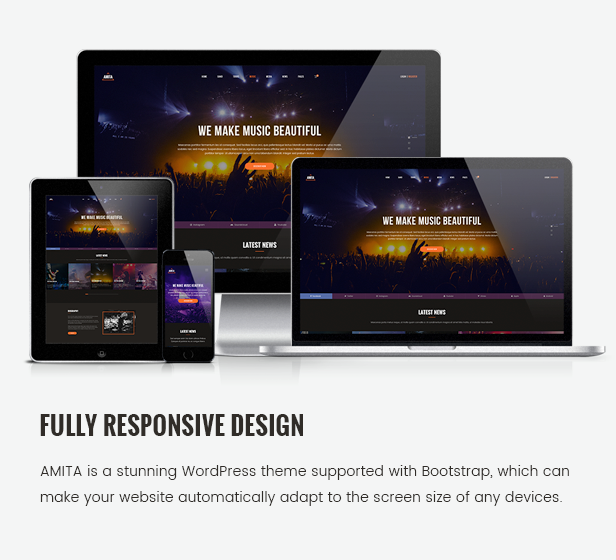 + Updated Amita Plugin V1.3.2 to fix the problem that Album element did not work correctly. + Updated Slider Revolution plugin v5.4.7.4. + Added new page Contact with Contact Form 7. + Added new option Album Type in Album detail Option in Theme Option. + Added new option Song Type in Song detail Option in Theme Option. + Added new option Genre Type in Genre detail in Theme Option. + Added an option to show/hide Album Count Play in Album Detail Option. + Added an option to show/hide Download icon in Album Detail Option. + Added an option to change Tab name in Artist & Band Detail Option. + Fixed error with song source "Add Url or Embed Code" that was not work. + Compatible with Music Press Pro v1.2. + Updated Amita plugin v1.3.1 to be compatible with Amita 1.5.1. + Added new Header Type Music Store. + Added new Theme version Music Store. + Added new Home version Music Store. + Fixed error in Artist Detail that the total of songs was fixed in 12. + Fixed error in Media page that images were not in grid. + Fixed error with Instagram Widget. + Updated Album Detail that tabs will not be shown if content is not added from backend. + Updated Amita plugin v1.3 to be compatible with Amita 1.5. + Updated Slider Revolution plugin v5.4.7.3. + Fixed error that could not translate month in widget Event List. + Added sharing option for song detail and album detail in Theme Options. + Added option to change image of a disk when hovering an album in Album Release element. + Updated Amita plugin v1.2.2 to be compatible with Amita 1.4.1. 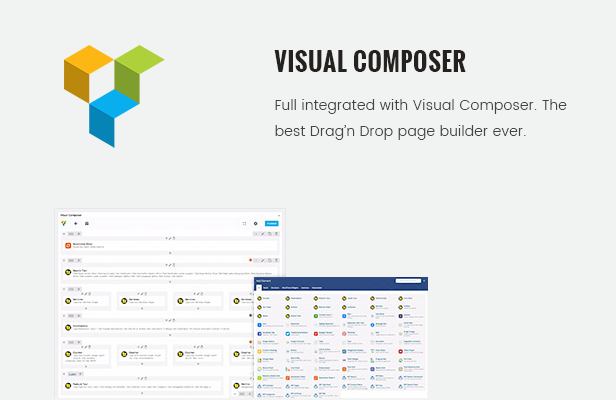 + Updated Visual Composer plugin v5.4.7. + Fixed error that could not translate months in Tour Date element. + Updated Artist Detail and Band Detail so that when information of Album, Video and Song tab is not added, these tabs will not appear. 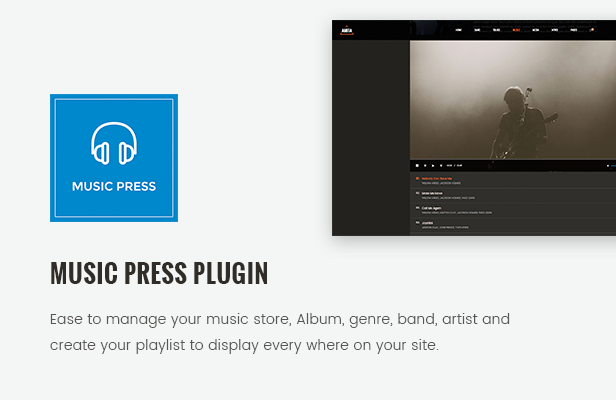 + Removed music-press-pro.zip in the theme package and used Music Press Pro plugin on wordpress.org. + Updated Album Tracklist element and Album detail so that it is possible to select Band or Artists presenting the album. + Updated Amita plugin v1.2.1 to be compatible with Amita 1.4. 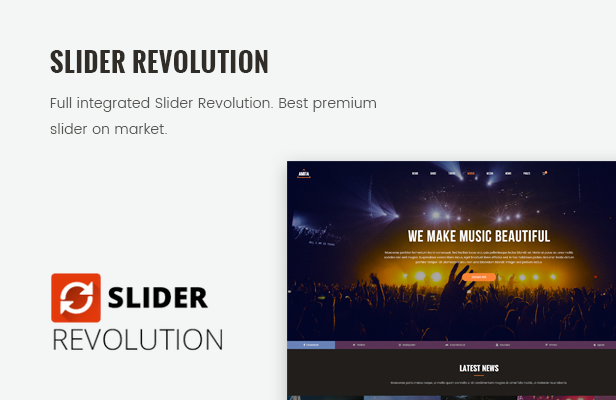 + Updated Slider Revolution plugin v5.4.7.1. + Fixed error that menu type 1 was not sticky on mobile. + Added new home version 2. - Added Upcoming Shows element. - Added Product Category element. - Added Featured Product element. - Added Top Rated Product element. - Added Recent Product element. - Added Sale Product element. - Added Best Selling Product element. - Updated Featured Video element. + Added Option unlimited color. + Upgraded Music Press plugin to Music Press Pro version. 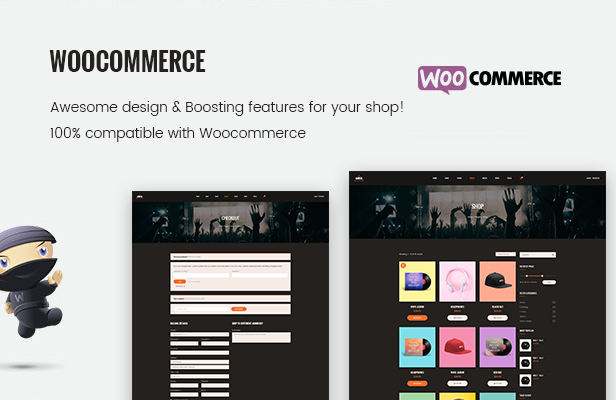 + Fully compatible with WooCommerce v.3.3.1. + Updated Slider Revolution plugin v5.4.7. + Updated Amita plugin v1.1 to be compatible with Amita 1.2. The best support you can get! 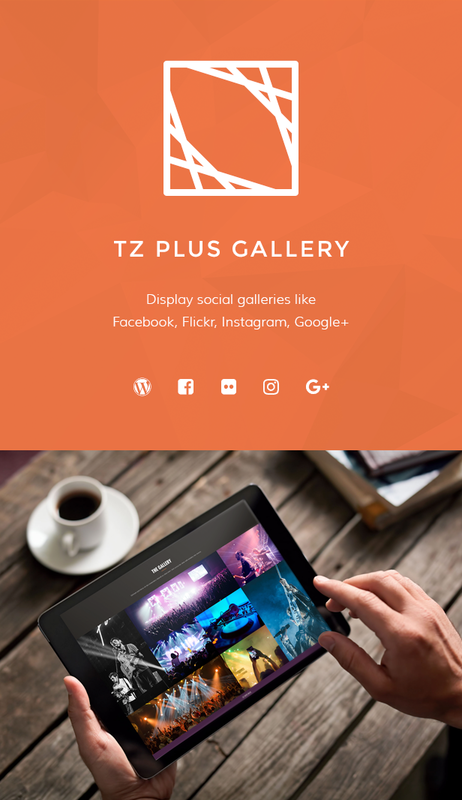 Great theme, highly custable. Fast and good support. Theme is recommended. Would be a plus if there was theme layout support for Contact Form 7 and Spotify icons for social media. Best theme for music bands or musicians. Best customer support I’ve ever had. Great theme, some small bugs with the music player.